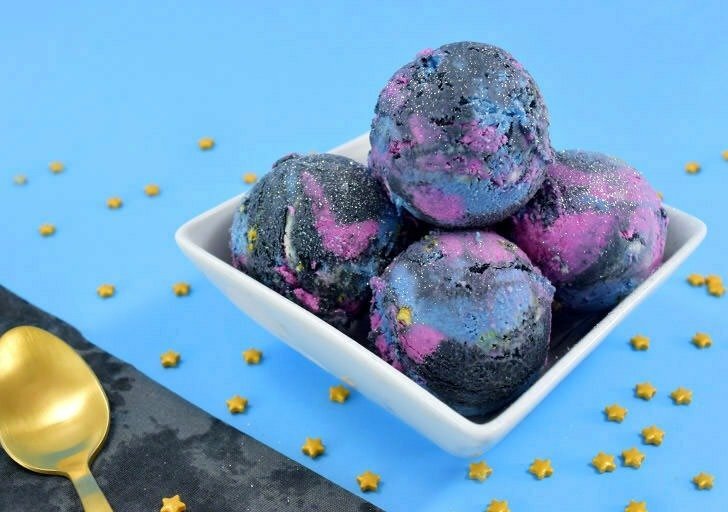 Galaxy Ice Cream – Out of this World Grape! So you guys know I love the galaxy stuff… There are the Galaxy Easter Eggs, the Galaxy Slip On Shoes, Galaxy Cross-stitched Cuff Bracelet, Galaxy Pumpkin/Jack-o-lantern, Galaxy desk lamp, and, oh, we’d better not forget the Glitter Galaxy Easter Eggs. 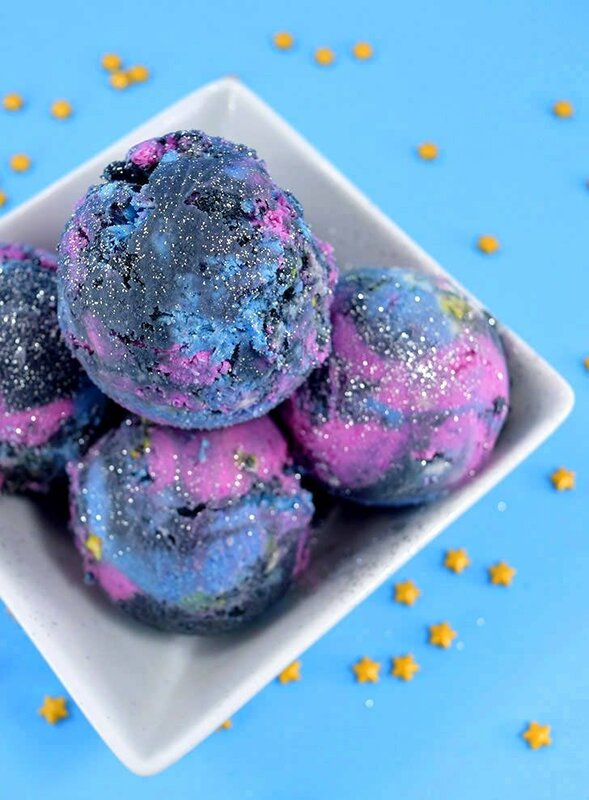 Well today I’m taking all things galaxy one step further and introduce your belly and taste-buds to one of the coolest things to happen to crafts since Puffy Paint… I give you, Grape Flavored Galaxy Ice Cream. Boom! 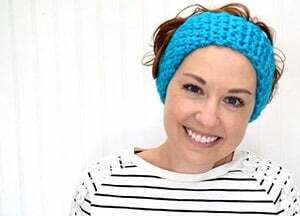 This recipe is super easy to do and the results are stunning. This ice cream scoops up really well for pretty presentation. I mean, look at that? 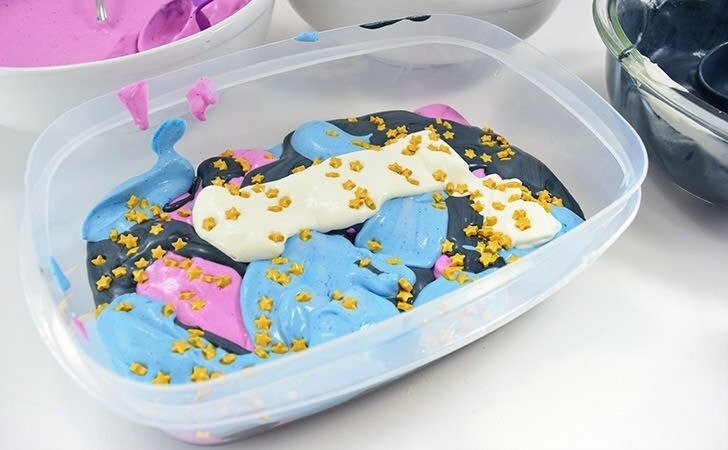 I’m making a lot of ice cream, I’ll admit, and I’m getting some scooping experience to give the gals at Baskin Robbins a run for their money, but this super easy, no ice cream machine needed recipe I’ve been tweaking the last few weeks gives you the prettiest darn scoops! 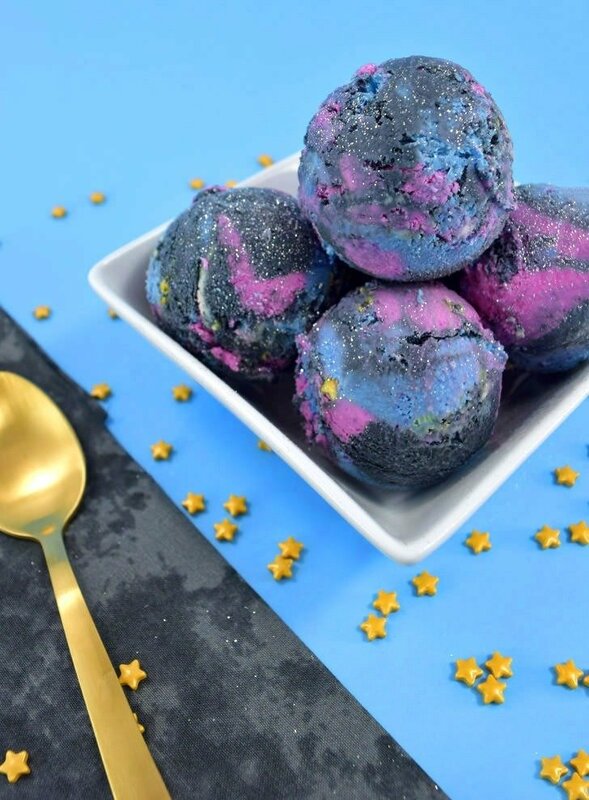 Want to make ice cream that is out of this world? This recipe is super easy and easily changed with the substitution of your favorite fruit juice! This recipe uses Disco Dust “edible” glitter for a little extra pizzazz. I’m comfortable feeding it to my friends and family on very rare occasions. Not all are comfortable with this, and I totally understand, so please feel free to withhold the disco dust from your presentation if you feel this way. In a large bowl mix together condensed milk, heavy cream and grape juice (or juice of your choice). If you prefer a more firm ice cream, whip the mixture with a hand mixer or in a blender until very loose peaks begin to form. Over whipping can create a crumbly rather than smooth ice cream, with the added juice to take care. Divide mixture out and color blue, purple, black, pink and leave a small amount white. Freeze just long enough for the ice cream to thicken. It needs to still be “spoonable” but not really runny. Layer blobs of color in an air tight container. Add sprinkles and disco dust as you please. Cover and freeze 4-6 hours, though overnight is best. Now this grape recipe has been in my stash for ages and I’ve made it for years. This the first attempt to jazz it up with a design and it worked out so well! Make a whole bunch of batches and you’ve got the perfect accompaniment to cake any little space lover has ever, ever seen!